Abstract: Based on original descriptions of brain calcification by Theodor Fahr, brain calcification, and more specifically basal ganglia calcification, is referred to as Fahr's syndrome. Recent identification of genetic mutations has concerted the description of this erstwhile heterogeneous condition which we refer to here as Fahr's disease. Fahr's disease refers to idiopathic calcification of the basal ganglia without a secondary (non-genetic) cause. Idiopathic basal ganglia calcification (IBGC) is another term, which offers a more accurate description of this condition. Within the last 2 years, genetic mutations for IBGC have been described in SLC20A2, PDGFB, and PDGFRB. These findings broaden our understanding of the pathophysiology and encourage a search for specific treatment options in this rare but disabling condition. Clinically, parkinsonism, dystonia, and other movement disorders are the most common clinical features, but psychiatric features can predominate. Cases with confirmed genetic mutations reveal new clinical features linked with Fahr's disease, such as headaches. 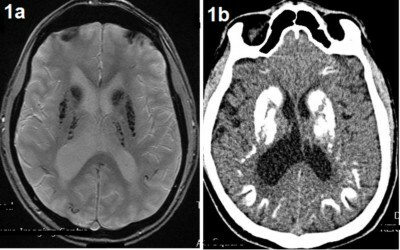 Computed tomography or magnetic resonance imaging is usually the trigger for suspecting Fahr's disease and important for identifying the calcification pattern. Symmetric calcification of the globus pallidus, thalamus, and dentate nucleus is the most common pattern in IBGC, but other parts of the brain such as the cerebellum are involved. Treatment of Fahr's disease is currently limited and is largely symptomatic. A better understanding of this condition in light of genetic findings is important to improve the clinical diagnosis and develop specific treatment options.